In the days of King Alfred, there lived a poor woman whose cottage was situated in a remote country village, a great many miles from London. She had been a widow some years, and had an only child named Jack, whom she indulged to a fault. The consequence of her blind partiality was, that Jack did not pay the least attention to any thing she said, but was indolent, careless, and extravagant. His follies were not owing to a bad disposition, but that his mother had never checked him. By degrees she disposed of all she possessed—scarcely any thing remained but a cow. The poor woman one day met Jack with tears in her eyes; her distress was great, and for the first time in her life she could not help reproaching him, saying, "Oh! you wicked child, by your ungrateful course of life you have at last brought me to beggary and ruin. Cruel, cruel boy! I have not money enough to purchase even a bit of bread for another day—nothing now remains to sell but my poor cow! I am sorry to part with her; it grieves me sadly, but we must not starve." For a few minutes, Jack felt a degree of remorse, but it was soon over, and he began teasing his mother to let him sell the cow at the next village, so much, that she at last consented. As he was going along, he met a butcher, who inquired why he was driving the cow from home? Jack replied, he was going to sell it. The butcher held some curious beans in his hat; they were of various colours, and attracted Jack's attention. This did not pass unnoticed by the butcher, who, knowing Jack's easy temper, thought now was the time to take an advantage of it; and determined not to let slip so good an opportunity, asked what was the price of the cow, offering at the same time all the beans in his hat for her. The silly boy could not conceal the pleasure he felt at what he supposed so great an offer, the bargain was struck instantly, and the cow exchanged for a few paltry beans. Jack made the best of his way home, calling aloud to his mother before he reached home, thinking to surprise her. When she saw the beans, and heard Jack's account, her patience quite forsook her. She kicked the beans away in a passion—they flew in all directions—some were scattered in the garden. Not having any thing to eat, they both went supperless to bed. Jack woke early in the morning, and seeing something uncommon from the window of his bed-chamber, ran down stairs into the garden, where he soon discovered that some of the beans had taken root, and sprung up surprisingly: the stalks were of an immense thickness, and had so entwined, that they formed a ladder nearly like a chain in appearance. Looking upward, he could not discern the top, it appeared to be lost in the clouds: he tried it, found it firm, and not to be shaken. He quickly formed the resolution of endeavouring to climb up to the top, in order to seek his fortune, and ran to communicate his intention to his mother, not doubting but she would be equally pleased with himself. She declared he should not go; said it would break her heart if he did—entreated, and threatened—but all in vain. 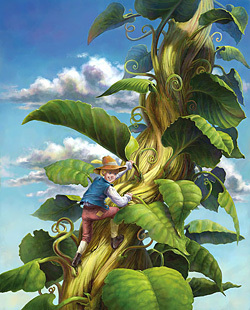 Jack set out, and after climbing for some hours, reached the top of the bean-stalk, fatigued and quite exhausted. Looking around, he found himself in a strange country; it appeared to be a desert, quite barren, not a tree, shrub, house, or living creature to be seen; here and there were scattered fragments of stone; and at unequal distances, small heaps of earth were loosely thrown together. "Your father was a rich man, his disposition remarkably benevolent: he was very good to the poor, and constantly relieving them. He made it a rule never to let a day pass without doing good to some person. On one particular day in the week, he kept open house, and invited only those who were reduced and had lived well. He always presided himself, and did all in his power to render his guests comfortable; the rich and the great were not invited. The servants were all happy, and greatly attached to their master and mistress. Your father, though only a private gentleman, was as rich as a prince, and he deserved all he possessed, for he only lived to do good. Such a man was soon known and talked of. A giant lived a great many miles off: this man was altogether as wicked as your father was good; he was in his heart envious, covetous, and cruel; but he had the art of concealing those vices. He was poor, and wished to enrich himself at any rate. Hearing your father spoken of, he formed the design of becoming acquainted with him, hoping to ingratiate himself into your father's favour. He removed quickly into your neighbourhood, caused to be reported that he was a gentleman who had just lost all he possessed by an earth-quake, and found it difficult to escape with his life; his wife was with him. Your father gave credit to his story, and pitied him, gave him handsome apartments in his own house, and caused him and his wife to be treated like visitors of consequence, little imagining that the giant was meditating a horrid return for all his favours. "Things went on in this way for some time, the giant becoming daily more impatient to put his plan into execution; at last a favourable opportunity presented itself. Your father's house was at some distance from the seashore, but with a glass the coast could be seen distinctly. The giant was one day using the telescope; the wind was very high; he saw a fleet of ships in distress off the rocks; he hastened to your father, mentioned the circumstance, and eagerly requested he would send all the servants he could spare to relieve the sufferers. Every one was instantly despatched, except the porter and your nurse; the giant then joined your father in the study, and appeared to be delighted—he really was so. Your father recommended a favourite book, and was handing it down: the giant took the opportunity, and stabbed him; he instantly fell down dead. The giant left the body, found the porter and nurse, and presently despatched them; being determined to have no living witnesses of his crimes. You were then only three months old; your mother had you in her arms in a remote part of the house, and was ignorant of what was going on; she went into the study, but how was she shocked, on discovering your father a corpse, and weltering in his blood! she was stupefied with horror and grief, and was motionless. The giant, who was seeking her, found her in that state, and hastened to serve her and you as he had done her husband, but she fell at his feet, and in a pathetic manner besought him to spare your life and hers. "Remorse, for a moment, seemed to touch the barbarian's heart: he granted your lives; but first he made her take a most solemn oath, never to inform you who your father was, or to answer any questions concerning him: assuring her that if she did, he would certainly discover her, and put both of you to death in the most cruel manner. Your mother took you in her arms, and fled as quickly as possible; she was scarcely gone when the giant repented that he had suffered her to escape. He would have pursued her instantly; but he had to provide for his own safety; as it was necessary he should be gone before the servants returned. Having gained your father's confidence, he knew where to find all his treasure: he soon loaded himself and his wife, set the house on fire in several places, and when the servants returned, the house was burned quite down to the ground. Your poor mother, forlorn, abandoned, and forsaken, wandered with you a great many miles from this scene of desolation. Fear added to her haste. She settled in the cottage where you were brought up, and it was entirety owing to her fear of the giant that she never mentioned your father to you. I became your father's guardian at his birth; but fairies have laws to which they are subject as well as mortals. A short time before the giant went to your father's, I transgressed; my punishment was a suspension of power for a limited time—an unfortunate circumstance, as it totally prevented my succouring your father. "The day on which you met the butcher, as you went to sell your mother's cow, my power was restored. It was I who secretly prompted you to take the beans in exchange for the cow. By my power, the bean-stalk grew to so great a height, and formed a ladder. I need not add that I inspired you with a strong desire to ascend the ladder. The giant lives in this country: you are the person appointed to punish him for all his wickedness. You will have dangers and difficulties to encounter, but you must persevere in avenging the death of your father, or you will not prosper in any of your undertakings, but will always be miserable. As to the giant's possessions, you may seize on all you can; for every thing he has is yours, though now you are unjustly deprived of it. One thing I desire—do not let your mother know you are acquainted with your father's history, till you see me again. Go along the direct road, you will soon see the house where your cruel enemy lives. While you do as I order you, I will protect and guard you; but, remember, if you dare disobey my commands, a most dreadful punishment awaits you." When the fairy had concluded, she disappeared, leaving Jack to pursue his journey. He walked on till after sunset, when, to his great joy, he espied a large mansion. This agreeable sight revived his drooping spirits; he redoubled his speed, and soon reached it. A plain-looking woman was at the door—he accosted her, begging she would give him a morsel of bread and a night's lodging. She expressed the greatest surprise at seeing him; and said it was quite uncommon to see a human being near their house, for it was well known that her husband was a large and very powerful giant, and that he would never eat any thing but human flesh, if he could possibly get it; that he did not think any thing of walking fifty miles to procure it, usually being out the whole day for that purpose. This account greatly terrified Jack, but still he hoped to elude the giant, and therefore he again entreated the woman to take him in for one night only, and hide him where she thought proper. The good woman at last suffered herself to be persuaded, for she was of a compassionate and generous disposition, and took him into the house. First, they entered a fine large hall, magnificently furnished; they then passed through several spacious rooms, all in the same style of grandeur; but they appeared to be quite forsaken and desolate. A long gallery was next; it was very dark—just light enough to show that, instead of a wall on one side, there was a grating of iron, which parted off a dismal dungeon, from whence issued the groans of those poor victims whom the cruel giant reserved in confinement for his own voracious appetite. Poor Jack was half dead with fear, and would have given the world to have been with his mother again, for he now began to fear that he should never see her more, and gave himself up for lost; he even mistrusted the good woman, and thought she had let him into the house for no other purpose than to lock him up among the unfortunate people in the dungeon. At the farther end of the gallery there was a spacious kitchen, and a very excellent fire was burning in the grate. The good woman bid Jack sit down, and gave him plenty to eat and drink. Jack, not seeing any thing here to make him uncomfortable, soon forgot his fear, and was just beginning to enjoy himself, when he was aroused by a loud knocking at the street-door, which made the whole house shake: the giant's wife ran to secure him in the oven, and then went to let her husband in. Jack heard him accost her in a voice like thunder, saying: "Wife, I smell fresh meat." "Oh! my dear," replied she, "it is nothing but the people in the dungeon." The giant appeared to believe her, and walked into the very kitchen where poor Jack was concealed, who shook, trembled, and was more terrified than he had yet been. At last, the monster seated himself quietly by the fire-side, whilst his wife prepared supper. By degrees Jack recovered himself sufficiently to look at the giant through a small crevice. He was quite astonished to see what an amazing quantity he devoured, and thought he never would have done eating and drinking. When supper was ended, the giant desired his wife to bring him his hen. A very beautiful hen was then brought, and placed on the table before him. Jack's curiosity was very great to see what would happen: he observed that every time the giant said "Lay!" the hen laid an egg of solid gold. The giant amused himself a long time with his hen; meanwhile his wife went to bed. At length the giant fell asleep by the fire-side, and snored like the roaring of a cannon. At daybreak, Jack, finding the giant still asleep, and not likely to awaken soon, crept softly out of his hiding-place, seized the hen, and ran off with her. He met with some difficulty in finding his way out of the house, but at last he reached the road with safety. He easily found the way to the bean-stalk, and descended it better and quicker than he expected. His mother was overjoyed to see him; he found her crying bitterly, and lamenting his hard fate, for she concluded he had come to some shocking end through his rashness. Jack was impatient to show his hen, and inform his mother how valuable it was. "And now, mother," said Jack, "I have brought home that which will quickly make us rich; and I hope to make you some amends for the affliction I have caused you through my idleness, extravagance, and folly." The hen produced as many golden eggs as they desired: they sold them, and in a little time became possessed of as much riches as they wanted. For some months Jack and his mother lived very happily together; but he being very desirous of travelling, recollecting the fairy's commands, and fearing that if he delayed, she would put her threats into execution, longed to climb the bean-stalk, and pay the giant another visit, in order to carry away some more of his treasures; for, during the time that Jack was in the giant's mansion, whilst he lay concealed in the oven, he learned from the conversation that took place between the giant and his wife, that he possessed some wonderful curiosities. Jack thought of his journey again and again, but still he could not summon resolution enough to break it to his mother, being well assured that she would endeavour to prevent his going. However, one day he told her boldly that he must take a journey up the bean-stalk; she begged and prayed him not to think of it, and tried all in her power to dissuade him: she told him that the giant's wife would certainly know him again, and that the giant would desire nothing better than to get him into his power, that he might put him to a cruel death, in order to be revenged for the loss of his hen. Jack, finding that all his arguments were useless, pretended to give up the point, though resolved to go at all events. He had a dress prepared which would disguise him, and something to colour his skin. He thought it impossible for any one to recollect him in this dress. In a few mornings after this, he arose very early, changed his complexion, and, unperceived by any one, climbed the bean-stalk a second time. He was greatly fatigued when he reached the top, and very hungry. Having rested some time on one of the stones, he pursued his journey to the giant's mansion. He reached it late in the evening: the woman was at the door as before. Jack addressed her, at the same time telling her a pitiful tale, and requesting that she would give him some victuals and drink, and also a night's lodging. She told him (what he knew before very well) about her husband being a powerful and cruel giant; and also that she one night admitted a poor, hungry, friendless boy, who was half dead with travelling; that the little ungrateful fellow had stolen one of the giant's treasures; and, ever since that, her husband had been worse than before, used her very cruelly, and continually upbraided her with being the cause of his misfortune. Jack was at no loss to discover that he was attending to the account of a story in which he was the principal actor. He did his best to persuade the good woman to admit him, but found it a very hard task. At last she consented; and as she led the way, Jack observed that every thing was just as he had found it before. She took him into the kitchen, and after he had done eating and drinking, she hid him in an old lumber-closet. The giant returned at the usual time, and walked in so heavily, that the house was shaken to its foundation. He seated himself by the fire, and soon after exclaimed: "Wife! I smell fresh meat!" The wife replied, it was the crows, who had brought a piece of raw meat, and left it on the top of the house. Whilst supper was preparing, the giant was very ill-tempered and impatient, frequently lifting up his hand to strike his wife, for not being quick enough; she, however, was always so fortunate as to elude the blow. He was also continually up-braiding her with the loss of his wonderful hen. The giant at last having ended his voracious supper, and eaten till he was quite satisfied, said to his wife: "I must have something to amuse me; either my bags of money or my harp." After a great deal of ill-humour, and having teased his wife some he commanded her to bring down his bags of gold and silver. Jack, as before, peeped out of his hiding-place, and presently his wife brought two bags into the room: they were of a very large size; one was filled with new guineas, and the other with new shillings. They were both placed before the giant, who began reprimanding his poor wife most severely for staying so long; she replied, trembling with fear, that they were so heavy, that she could scarcely lift them; and concluded, at last, that she would never again bring them down stairs; adding, that she had nearly fainted, owing to their weight This so exasperated the giant, that he raised his hand to strike her; she, however, escaped, and went to bed, leaving him to count over his treasure, by way of amusement. The giant took his bags, and after turning them over and over, to see that they were in the same state as he left them, began to count their contents. First, the bag which contained the silver was emptied, and the contents placed upon the table. Jack viewed the glittering heaps with delight, and most heartily wished them in his own possession. The giant (little thinking he was so narrowly watched) reckoned the silver over several times; and then, having satisfied himself that all was safe, put it into the bag again, which he made very secure. The other bag was opened next, and the guineas placed upon the table. If Jack was pleased at the sight of the silver, how much more delighted he felt when he saw such a heap of glittering gold! He even had the boldness to think of gaming both bags; but suddenly recollecting himself, he began to fear that the giant would sham sleep, the better to entrap any one who might be concealed. When the giant had counted over the gold till he was tired, he put it up, if possible, more secure than he had put up the silver before; he then fell back on his chair by the fire-side, and fell asleep. He snored so loud, that Jack compared his noise to the roaring of the sea in a high wind, when the tide is coming in. At last, Jack concluded him to be asleep, and therefore secure, stole out of his hiding-place, and approached the giant, in order to carry off the two bags of money; but just as he laid his hand upon one of the bags, a little dog, whom he had not perceived before, started from under the giant's chair, and barked at Jack most furiously, who now gave himself up for lost. Fear riveted him to the spot. Instead of endeavouring to escape, he stood still, though expecting his enemy to awake every instant. Contrary, however, to his expectation, the giant continued in a sound sleep, and the dog grew weary of barking. Jack now began to recollect himself, and on looking round, saw a large piece of meat; this he threw to the dog, who instantly seized it, and took it into the lumber-closet, which Jack had just left. Finding himself delivered from a noisy and troublesome enemy, and seeing the giant did not awake, Jack boldly seized the bags, and throwing them over his shoulders, ran out of the kitchen. He reached the street door in safety, and found it quite daylight. In his way to the top of the bean-stalk, he found himself greatly incommoded with the weight of the money-bags; and really they were so heavy that he could scarcely carry them. Jack was overjoyed when he found himself near the bean-stalk; he soon reached the bottom, and immediately ran to seek his mother; to his great surprise, the cottage was deserted; he ran from one room to another, without being able to find any one; he then hastened into the village, hoping to see some of the neighbours, who could inform him where he could find his mother. An old woman at last directed him to a neighbouring house, where she was ill of a fever. He was greatly shocked on finding her apparently dying, and could scarcely bear his own reflections, on knowing himself to be the cause. On being informed of our hero's safe return, his mother, by degrees, revived, and gradually recovered. Jack presented her with his two valuable bags. They lived happily and comfortably; the cottage was rebuilt, and well furnished. For three years Jack heard no more of the bean-stalk, but he could not forget it; though he feared making his mother unhappy. She would not mention the hated bean-stalk, lest it should remind him of taking another journey. Notwithstanding the comforts Jack enjoyed at home, his mind dwelt continually upon the bean-stalk; for the fairy's menaces, in case of his disobedience, were ever present to his mind, and prevented him from being happy; he could think of nothing else. It was in vain endeavouring to amuse himself; he became thoughtful, and would arise at the first dawn of day, and view the bean-stalk for hours together. His mother saw that something preyed heavily upon his mind, and endeavoured to discover the cause; but Jack knew too well what the consequence would be, should she succeed. He did his utmost, therefore, to conquer the great desire he had for another journey up the bean-stalk. Finding, however, that his inclination grew too powerful for him, he began to make secret preparations for his journey, and on the longest day, arose as soon as it was light, ascended the bean-stalk, and reached the top with some little trouble. He found the road, journey, etc., much as it was on the two former times; he arrived at the giant's mansion in the evening, and found his wife standing, as usual, at the door. Jack had disguised himself so completely, that she did not appear to have the least recollection of him; however, when he pleaded hunger and poverty, in order to gain admittance, he found it very difficult to persuade her. At last he prevailed, and was concealed in the copper. When the giant returned, he said, "I smell fresh meat!" But Jack felt quite composed, as he had said so before, and had been soon satisfied. However, the giant started up suddenly, and, notwithstanding all his wife could say, he searched all round the room. Whilst this was going forward, Jack was exceedingly terrified, and ready to die with fear, wishing himself at home a thousand times; but when the giant approached the copper, and put his hand upon the lid, Jack thought his death was certain. The giant ended his search there, without moving the lid, and seated himself quietly by the fire-side. This fright nearly overcame poor Jack; he was afraid of moving or even breathing, lest he should be discovered. The giant at last ate a hearty supper. When he had finished, he commanded his wife to fetch down his harp. Jack peeped under the copper-lid, and soon saw the most beautiful harp that could be imagined: it was placed by the giant on the table, who said, "Play!" and it instantly played of its own accord, without being touched. The music was uncommonly fine. Jack was delighted, and felt more anxious to get the harp into his possession, than either of the former treasures. The giant's soul was not attuned to harmony, and the music soon lulled him into a sound sleep. Now, therefore, was the time to carry off the harp, as the giant appeared to be in a more profound sleep than usual Jack soon determined, got out of the copper, and seized the harp, The harp was enchanted by a fairy: it called out loudly: "Master! master!" The giant awoke, stood up, and tried to pursue Jack; but he had drank so much, that he could hardly stand. Poor Jack ran as fast as he could. In a little time the giant recovered sufficiently to walk slowly, or rather, to reel after him. Had he been sober, he must have overtaken Jack instantly; but, as he then was, Jack contrived to be first at the top of the bean-stalk. The giant called after him in a voice like thunder, and sometimes was very near him. The moment Jack got down the bean-stalk he called out for a hatchet; one was brought him directly; just at that instant, the giant was beginning to descend; but Jack, with his hatchet, cut the bean-stalk close off at the root, which made the giant fall headlong into the garden: the fall killed him, thereby releasing the world from a barbarous enemy. Jack's mother was delighted when she saw the bean-stalk destroyed. At this instant the fairy appeared: she first addressed Jack's mother and explained every circumstance relating to the journeys up the bean-stalk. The fairy charged Jack to be dutiful to his mother, and to follow his father's good example, which was the only way to be happy. She then disappeared. Jack heartily begged his mother's pardon for all the sorrow and affliction he had caused her, promising most faithfully to be very dutiful and obedient to her for the future.